I've not been about much, you can blame the daily grind of work for that. But I've got a few exciting things I've been working on, fear not! In the meantime, I've been finding some really funky covers for German Transformer comics which I present for your enjoyment. I've not got them all sadly, and any information on them at all would be welcome. 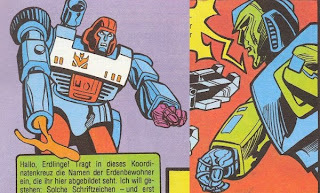 Most foreign Transformer comics just reused the US artwork, but in Germany, oh-ho, no they did not!